The famous Lion of Amphipolis – keeper of a grim mystery? Last week, the 26th Annual Scientific Meeting on Archaeological Works in Macedonia and Thrace took place at Aristotle University in Thessaloniki. 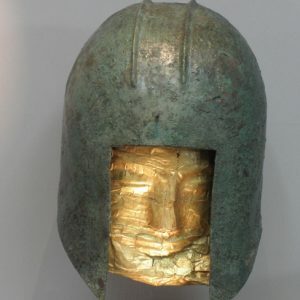 This is an important event, as it offers some preliminary access to very recent excavations and research – often years before formal publications become available – for a region that has thousands of years of history and is, of course, the homeland of Alexander the Great (we explore the region on our Exploring Macedonia tour). 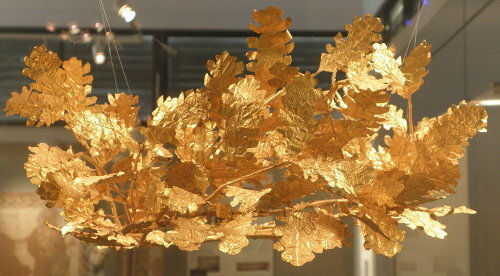 As always, many very interesting results were presented, including reports from last year’s excavation seasons at key sites such as Pella, the ancient capital of Macedon, or at Vergina/Aigai, the burial ground of Macedonian royalty. But one of the most astonishing presentations came from Amphipolis, at the eastern edge of Central Macedonia. Founded as an Athenian colony in 437 BC, the city was conquered by Philip II of Macedon in 357 BC and became an important economic centre within the region. 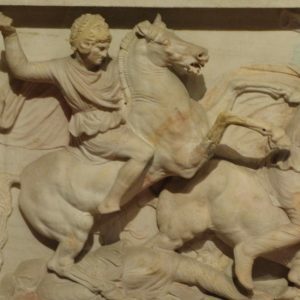 Under Philip’s son, Alexander the Great, it also gained great military significance, especially as a naval hub. It was from here that his armies and fleets set out for the campaign against the Persian Empire in 335 BC. Today, the site features numerous excavations, scattered over a very large area in a beautiful, fertile and rolling countryside. Ranging from Classical to Byzantine in date, they include city walls, sanctuaries, tombs, a gymnasium, several Early Christian churches and more, plus an excellent archaeological museum. 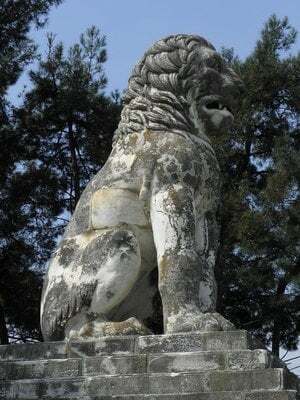 But the most striking sight to behold at Amphipolis (so far) is the Lion Monument, an enormous stone effigy of a lion, about 4m (13ft) in height. Discovered in fragments in the early 20th century and later reconstructed, it is usually dated to the late 4th century BC. Conventionally, but not based on particularly strong evidence, it has been interpreted as marking the burial place of one of Alexander’s admirals, Nearchos, Androsthenes or Laomedon, all of whom were associated with the city. Enter Katerina Peristeri. 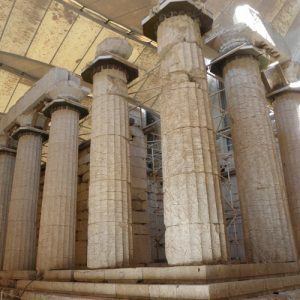 At the meeting, the Greek archaeologist has presented a discovery from 2012 that throws a wholly new light on the lion and allows for a fascinating possibility as to whom it really commemorated, namely that it stood on the tomb of Roxane, wife of Alexander the Great! Outsized by the Kasta Tomb? 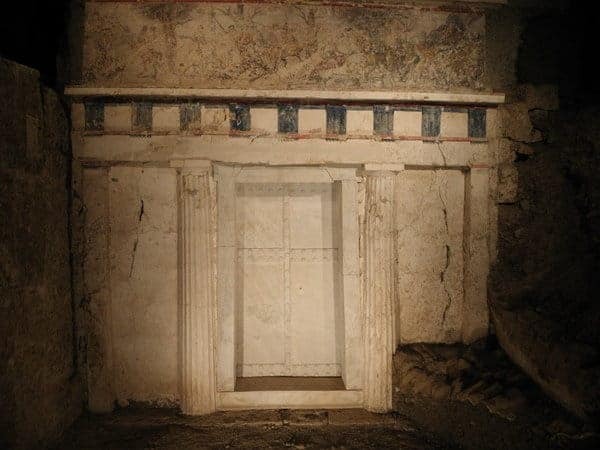 The facade of the grave of Philip II at Vergina. Peristeri has been excavating a nearby site known as the Kasta Tumulus, a seemingly heavily eroded circular earthen mound, comparable to royal burial mounds elsewhere in Macedon. 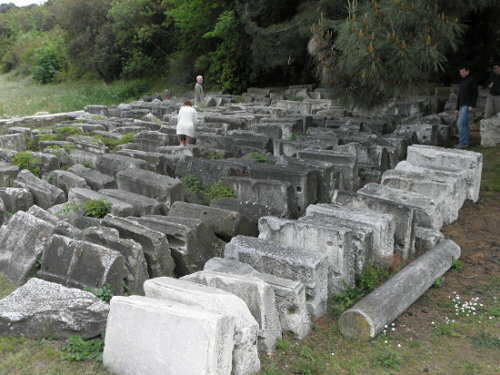 Her investigation has revealed the well-preserved foundation of a monumental perimeter wall of limestone, clad with finely cut slabs of marble brought from the island of Thasos. About 3m (10ft) high, it surrounds a mound with a perimeter of c. 500m (1640ft), or a diameter of 160m/525ft, and an estimated original height of over 25m (80ft), dimensions considerably larger than those of the famous Great Tumulus at Vergina, which contains the remains of Philip II and other members of the royal family. A monument of such size should contain one or several burial chambers, but archaeologists have not yet been able to explore the interior of the mound. So, who could be buried in such a distinguished tomb? Based on its apparent late 4th century date and unusual dimensions, Peristeri puts forward her own theory, speculative but fascinating. The historian Diodorus Siculus (19.52.4) reports that Alexander’s widow, the Bactrian princess Roxane, and his posthumous son Alexander IV Aigos, were placed under house arrest at Amphipolis by Alexander’s distant relative and successor as Macedonian ruler, Cassander. Also according to Diodorus (19.105.2, see link above), Cassander, recognising the existence of Alexander’s legitimate heir, now 14 years old, as a threat to his own power, had both of them murdered there in 309 BC. Peristeri thus proposes that the Kasta Tumulus is the tomb of Roxane and Alexander IV. She also draws a connection between it and Deinokrates, Alexander’s favourite architect, although it is not clear on what grounds. For the moment, this remains speculation. There can be little doubt that the mound belonged to an important personality’s grave, but Roxane and Alexander IV are by no means the only major characters in ancient Macedonian history whose final resting place remains unknown (it has also been surmised that they were buried at Vergina). Moreover, Diodorus points out that the murder of the two was kept secret, which would raise the question why and by whom such an enormous tumulus was erected over the tomb of Roxane. No doubt, further excavations will reveal more about the newly recognised monument. 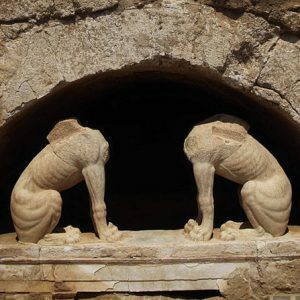 Meanwhile, you can visit Amphipolis and its Lion on our tour From the Slopes of Mt Olympus to the Shores of the Aegean: Exploring the Archaeology, Culture, Food and Wine of Macedonia. By now (October 2014), excavations have resumed (in the summer of 2014) and exposed unprecedented and sensational details of the tomb entrance, decorated with two marble sphinxes, a second entrance with caryatids and an extraordinary mosaic showing the abduction of Persephone and a looted tomb chamber. While news was revealed on a weekly basis, we were watching events and linking to updates on our Facebook page. In November of 2014, we published a new post: The Kasta Tumulus at Amphipolis – what we know for now.